This page introduces selection that follows from the origin of replicating molecules. It describes how the selection of an internal metabolism is generating net energy for self-replication, with a gradual unfolding of a population dynamic feed-back that selects for four lifeforms that differ in mass and allometric exponents. Evolution by natural selection follows from heritable differences in the self-replication rate; with the most basic form selecting the net energy that is required for replication. When other things are equal, this generates an exponential [ rε = d log ε / d τ ] increase on the per generation time-scale of natural selection (τ) in the net energy (ε) that is assimilated from the resource and made available for self-replication. Net energy [ ε=αβ ] is obtained by two traits; the mechanical/biochemical handling of resource assimilation (α), and the pace or speed of this process (β). Handling speed is mass specific work that is carried out by a mass specific energy that is selected as mass specific metabolism (β). This makes mass specific metabolism a proxy for the pace of the biological processes that generate net energy for self-replication, with selection for an exponential increase in resource handling, mass specific metabolism, and net assimilated energy [ rε=rα+rβ ]. The coupling between the pace of biological activity and the rate of mass specific metabolism creates a biological time-scale (τ) that is inversely related to mass specific metabolism [ τ ∝ 1/β ]. And with natural selection selecting changes between generations, it follows that this time defines the pre-generation time-scale of natural selection. The biological significance of the time-scale is illustrated by biological periods, where the lifespans of mice and elephants are quite different in physical time, but almost identical in biological time. The production of large offspring is dependent on net energy; but a quality-quantity trade-off, where a given amount of energy can produce many small or a few large offspring, selects for the absence of mass. In order for mass to be selected by an increase in the rate of self-replication with mass, an increase in mass (w) needs to generate more net energy (ε) than consumed by the increasing mass. Given no mass-rescaling (see below), this is the case when the exponent (e) for the body mass allometry of net energy [ ε ∝ we ] is larger than one. The selection of an initial metabolism that generates net energy is dependent on the mass of the molecules in the metabolic pathways, and on the mass of the heritable code that codes for the self-replicator and its metabolic pathways. An organised metabolism is also dependent on a compartment - like a cell – where the metabolic molecules can concentrate. The joint mass of a self-replicating cell with an internal metabolism and heritable code may thus be selected by the net energy that is generated by metabolism. This requires that the increase in mass specific metabolism with mass is stronger than linear, in order to outbalance the counteracting selection of the quality-quantity trade-off. This can be described by an allometry β ∝ wβββ• for mass specific metabolism (β), across the minimum masses (wβ) that are required to sustain given rates of mass specific metabolism. The ββ• exponent is then declining with mass from an initial value (ββ,0•), towards a final value of zero for the largest cells that have metabolic pathways that are completely developed. Given an initial exponent that is larger than one, this decline in the dependence of mass specific metabolism on mass is selecting for a self-replicating cell with a ββ• exponent of unity and incomplete metabolic pathways. The evolved mass is exactly so large that the increase in net energy with mass is balance by the energy that is taken by the quality-quantity trade-off, leaving no net energy for a further increase in replication. The selection increase in mass, however, cannot occur straightforwardly. This is because part of the net energy that is allocated to the offspring is used by the metabolism of the offspring instead of being allocated into the mass of the offspring. This causes the rearing period to increase, and the replication rate to decline, with an increase in mass; generating a partial trade-off selection for a decline in mass specific metabolism that will maintain the increased replication that is required for the selection increase in mass. But the partial decline in metabolism will eliminate the net energy that is required for the increased replication of the selection. This will induce a second partial selection for a dilation of the reproductive period that will maintain the rate of net assimilated energy and replication constant on the per generation time-scale of natural selection. The final result of this mass-rescaling selection (subscript w) is a partial decline in mass specific metabolism [ βw=wβw• with βw•<0 ] with an inverse time dilation [ τw=1/βw ] of biotic periods (τ). This causes the rate of net assimilated energy to decline in physical time, but not on the biological time-scale of natural selection. The final β• exponent for the allometry of mass specific metabolism [ β ∝ wβ• ] is then the product β• = ββ• + βw• < 1. 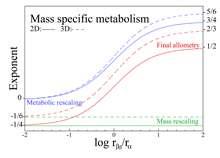 The dependence of mass specific metabolism on mass selects for small self-replicating cells with an underdeveloped metabolism, where mass specific metabolism is increasing linearly with mass for the equilibrium masses that are selected. The increase in metabolism with mass, however, cannot select the metabolism and mass to higher values because of the counteracting selection from the quality-quantity trade-off. But increased net energy generates population growth and interactive competition (ι). And this creates a mass bias in net energy [ ε (wi/w)ψι with ψι > 0 ] because the larger (wi) than average (w) individuals monopolise (ψ) the resource to some degree. This emergence of a resource bias selects for larger self-replicating cells with higher rates of mass specific metabolism; as defined by the β-dependent minimum mass that is required to sustain a pre-mass-rescaling mass specific metabolism that increases sub-linearly with mass [ ββ• = 1 - ψι* ]. This selection may continue with a mass bias that increases to unity [ ψι*=1 ], causing the evolution of a self-replicating cell with a fully developed metabolism and a ββ• exponent of zero. The mass bias in net energy from interactive competition is maintained at a mass selected maximum [ ψι*(wβ) ] as long as there is selection for the minimum mass (wβ) that is required to sustain the metabolism of the cell. But larger masses [ w > wβ ] are selected by the density dependent interactive competition when the exponent of the maximum mass bias evolves beyond unity [ ψι*>1 ] and the mass dependence of metabolism is vanishing [ ββ• = 1 - ψι* → 0 ]. This creates a major transition where a fully developed population dynamic feed-back from density dependent interactive competition selects net energy into mass at the cost of a continued increase in the mass bias of net energy. The equilibrium mass is where the negative selection of the quality-quantity trade-off is balanced by the positive selection from interactive competition. This coincides with a competitive interaction fix-point [ ι** = 1 / ψ ] where the intra-specific interference is invariant, smaller than the maximum (ι*), and defined by a mass bias exponent of unity [ ψ ι** = 1 ]. With organism masses that are selected beyond the minimum that is required for the metabolism of the cell, there is no longer direct selection for a single cell. Multicellularity may then evolve from the increased functionality that can be obtained from the division of a single large cell into a multitude of smaller cooperating cells. The inter-specific body mass variation that evolves from this population dynamic feed-back selection evolves primarily from inter-specific differences in net energy; the energy that generates the population growth and interactive selection of the population dynamic feed-back. And with pre-mass selection on metabolism being independent of mass, the ββ• exponent can, at least in principle, take any values from zero to one. 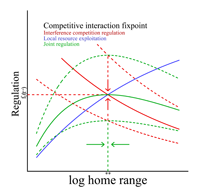 The exponent is one when the inter-specific variation in net energy is given exclusively by metabolic variation, and it is zero when the energetic differences follow from inter-specific variation in the handling of resources across ecological niches. To predict the selection response of the life history to the evolutionary changes in mass, we need to understand how the average life history is influencing the density dependence of the population dynamic feed-back selection on mass. fs(βH1/d/V) - the local resource exploitation of the average individual. These components are usually seen as a function of the population density (N); but they are also dependent on life history characters like mass specific metabolism (β), body mass (w), foraging speed (V), and home range (H); and on the spatial dimensionality (d) of the foraging behaviour. The magnitude of the life history response to the evolutionary changes in mass is determined by invariance in the life history dependence of the density regulation that is selected by the population dynamic feed-back selection on mass. This selection is optimising the home range to minimise the overall regulation [ fι fs ] of the counteracting forces of interference competition (fι) and local resource exploitation (fs). Superimposed on this, is the selection of mass selecting the population density where the interactive competition between individuals in optimal home ranges is matching the level of the competitive interaction fix-point that defines the selection attractor on mass. that selects for allometric correlations among the underlying traits; w, N, β, V and H.
Having the feed-back loop for the interactive selection of mass, the mass-rescaling selection of the metabolic trade-off between mass and time, and the home range optimisation of density regulation in place we have the two essential loops of population dynamic feed-back selection. The first loop is the density dependent interactive selection on mass with feed-back through the quality-quantity trade-off. The second includes metabolic trade-off selection with time dilation and density dependent selection on the home range, and it links selection on time periods, metabolism and home range with selection on mass. The mass-rescaling of the population dynamic feed-back is selecting on the covariance between the evolving mass and the other life history traits in order to maintain the optimal density regulation and the essential net energy on the time-scale of natural selection. This covariance is commonly known as body mass allometries [ y ∝ wx ] with the exponents (x) for the different traits (y) following from a solution of the equation system of the population dynamic feed-back selection. The exponents of these mass-rescaling allometries depend the spatial dimensions of the interactive behaviour, with the 1/4 and 3/4 exponents of Kleiber scaling evolving from interactive competition in two spatial dimensions, while the corresponding exponents for three dimensional interactions are 1/6 and 5/6. The 1/4 and 3/4 exponents of inter-specific Kleiber scaling evolve from mass-rescaling in multicellular animals with diverse resource handling across ecological niches. As such they depend on a body mass invariant pre-mass metabolism (ββ) with a ββ• exponent of zero. Body mass variation may though, more generally, depend also on differences in pre-mass metabolism. And this will generate an additional metabolic-rescaling, where the life history evolves also from the correlations with pre-mass metabolism and the dependence of the selected body mass on the net energy that is generated by the metabolic pre-mass component. These metabolic-rescaling allometries can be observed as the variation in the intercepts of Kleiber allometries for multicellular animals, where endotherms have higher metabolism, shorter lifespans, and lower mortality, reproduction and abundance than similar sized ectotherms. 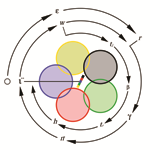 The final body mass allometries are the product between the metabolic-rescaling and mass-rescaling allometries. The former represents the importance of metabolism for the evolution of mass, and the latter the rescaling of the life history in response to the evolutionary changes in mass. It is only when these two components are considered together that we predict the allometric transitions across the tree of life. These include an approximate 5/6 exponent for mass specific metabolism in prokaryotes, a decline from 5/6 over zero to about -1/4 in protozoa, and -1/4 and -1/6 in multicellular animals dependent upon the spatial dimensionality of the interactive behaviour. And on the macro evolutionary scale from prokaryotes to mammals, there is an apparent invariance of mass specific metabolism with mass.